Makes Saturday night in Blackpool look tame! The play is set in a trashy 70’s disco in Liverpool, England. The action is mainly in the gents and women’s toilets of the disco where both Linda (The Bride) and Dave (The Groom) have decided to hold their stags and hens nights, not knowing that their other half is at the same place. When Linda’s ex-boyfriend, Peter, arrives this causes an uproar between Linda and Dave’s friends and when Linda’s hen party get a say in all that’s happening the two groups gang together to stop Linda taking up the offer of an escape with her ex Peter she is then forced with a difficult decision – to stay or to go. DESIGNER Lesley McKie skilfully transforms the Garrick’s main stage into nightclub toilets for Willy Russell’s reworked comedy Stags & Hens. This is the scene of much booze fuelled drama and while the play has a serious theme, about the need to sometimes break away from the familiar when “the familiar” is holding you back, most people will I imagine, go to see this to watch a group of young people letting their hair down and the inevitable carnage that follows such drinking sprees. While the repetitive strong language becomes boring, it does add authenticity to the piece and so do the lively and energetic performances of a cast who really convinced me there in party mood. Although most of the high jinks take place among Linda and her curious collection of mates, from the weepy Maureen to Bernie, a woman who has, to coin the phrase, been round the block a few times. Fiona Primrose is outstanding in this role and Francesca Heraghty-Smith equally impressive as Linda. Her evening takes a very complicated turn when an old flame turns up on her hen night. Josh Leach is very intimidating as Eddy, a frightening, thuggish control freak who thinks he can bully Linda into going down the aisle when she starts to have her doubts. Stags & Hens may not be Shakespeare but it’s a play with no pretensions that’s sure to strike a chord with anyone whose been on a stag or a hen do. While Russell over does the swearing – and I am definitely no prude – there are some brilliant comic lines to enjoy. Lines that offer us a reminder of just why this Scouse playwright is one of our greatest. 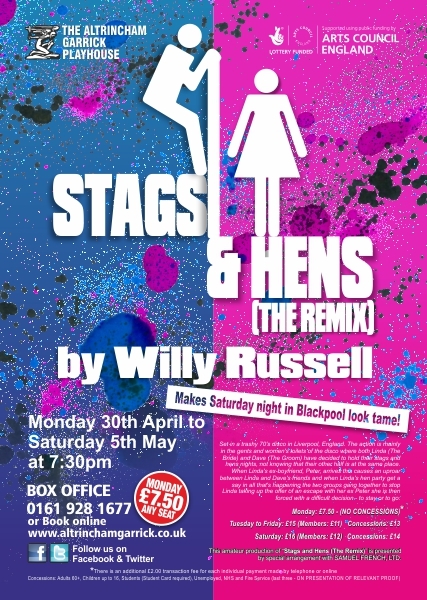 STAGS and Hens (The Remix), Willy Russell?s comedy, fills the Garrick Playhouse with laughter. We laugh as Stag and Hen Nights for Dave and Linda?s forthcoming marriage take place in a run-down Liverpool Club in 1977. What?s more, the bride, played by Francesca Heraghty-Smith and her friend, Megan Royle, who is Maureen, are both getting married for real in the next 12 months.The bride-to-be and groom-to-be, have no idea of each other?s presence. Well done Leslie Mckie for the effective split set revealing men?s and ladies? lavatories, where the action takes place. Francesca?s Linda starts to have doubts about her nuptials when she meets an old flame, booked for that night?s gig and doing well. He is Peter. Charismatic Ethan Martin makes him stand apart from the other lads who want his autograph. Adam Rogers? Dave is already inebriated when he arrives after downing a curry swilled down with alcohol. He spends his time throwing up in the loo and ends up semi-comatose. His best mate, Eddy, who insists that your own happiness should come first, is anti-celebrity. Linda?s best friend is Frances, played by Parissa Zamanpour. She always puts Linda?s interests first and remains loyal. Megan Royle?s portrayal of na?ve Maureen is good. All she wants is for everything to be nice including the joining together of bride and groom. Her sheltered life comes out every time she bursts into tears until Brandy and Babycham come to the rescue. The Garrick players retain and project their Liverpool accents throughout and indicate good teamwork. As for the bride, her friends think she has come to her senses but has she? This amateur production of ?Stags and Hens? is presented by special arrangement with SAMUEL FRENCH LTD.